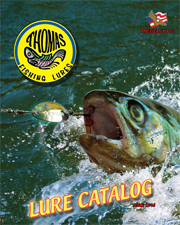 The Thomas Double Spinn is a unique twin-bladed, in-line spinner that is deadly on trout, and many other types of game fish and panfish. It is quality constructed with solid brass blades, “easy-spin” clevis’, solid brass beads (not hollow like cheap imitations), and a stainless steel shaft. The Indiana type blades are jewelry quality plated, either nickel or gold, to a highly-reflective, flashy finish. It is available in several two tone finishes. Made in the U.S.A.